Holy buckets! That was fun. 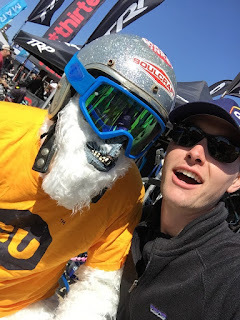 With the rapid pace of the cycling industry, some may consider Sea Otter Classic 2016 old news, but memories of the event, which took place from April 14-17, continue to flood my mind. With Sea Otter, it is what you make of it. Communicate, get involved, compete, and let loose for optimal enjoyment. Float around, focus on the traffic, and complain about the crazies for a negative experience. For me, with this being my first Sea Otter, I approached it with an open mind. 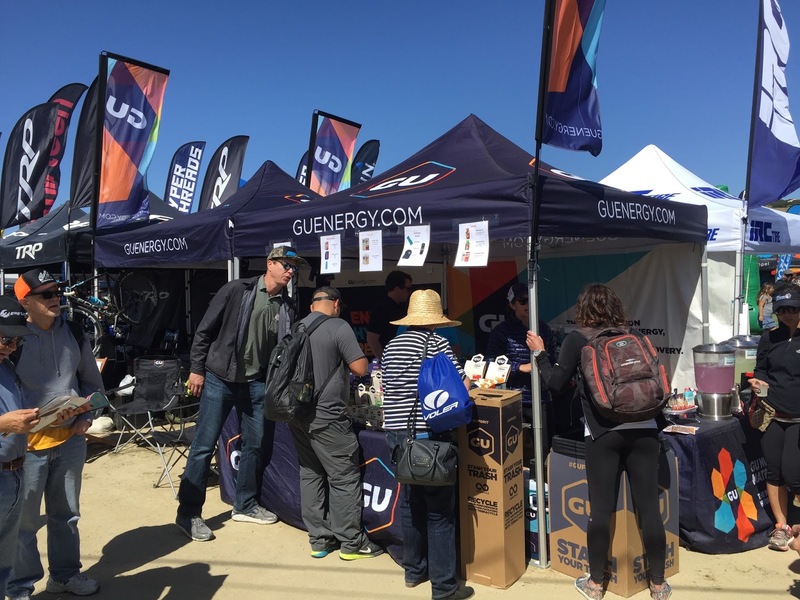 Fortunately, as the event approached, I was in contact with GU Energy Labs about working in their rocking booth. After assisting GU at Interbike Outdoor Demo 2015, I had been waiting for another opportunity to support the swift and upbeat company. Hurry up, wait. Drive. Hurry up, wait. Drive. Traffic. Park. This is why camping is rad! Entering the Laguna Seca Raceway was done and dusted for the weekend. Let the festivities begin. 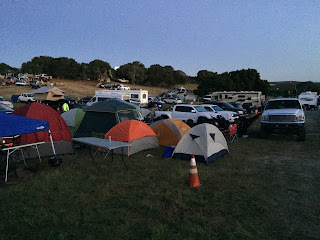 After entering the Sea Otter compound, the venue was still awaking at 9:15 a.m. on Friday. However, this provided me with the opportunity to meet Celia, Russ, Brian, and Roshelle, four rad GU employees! After noticing their smiles, energy, and positive outlook, I knew that Sea Otter was going to be a hit. Brian also had the main GU booth jamming to a classic rock playlist. Booyah. The GU booth was constantly flowing. It was a pleasure to work with Roshelle (left). Friday included communicating with GU consumers about its nutritional benefits. Mother and pops were in attendance at Sea Otter, which provided us with the opportunity to chat. I was also greeted by an obnoxious cyclist seeking free schwag... that happened to be Yuri Hauswald, Community Development Manager at GU and cycling industry extraordinaire. After seeing Yuri, I jumped into his arms. We shared a smile, laugh, big high five, and a quick chat. Oh, it is always a joy to see Yuri. Casual Salty the Yeti spotting. Friday was also the day that Celia and I enjoyed conversation with a woman stoked on GU product. She casually mentioned that she was over her co-workers bringing salads for lunch. "Bam, check out my recovery smoothie," she would tell them. GU Recovery Drink Mix is her meal substitute. Gets the job done and gets the co-workers jealous. Ba-da-bing. Early to bed, early to shred. Saturday included a 5 a.m. alarm for a 7:30 a.m. Gran Fondo start. It was insane to roll the Gran Fondo with my pops, Yuri, Blair - President at GU, Eric Benson - Owner at Art's Cyclery, Jason, and Von. New and old friends joined together for a great day in the saddle. Unfortunately, Brian Vaughan - CEO at GU, was not in attendance. A startling crash on Friday did not allow him to start on Saturday. After many rides with Brian, I felt his missing presence throughout the day. Fortunately, we still had the opportunity to share many wonderful conversations at Sea Otter. During the Gran Fondo, our crew pedaled through rolling hills, over five hours, while holding stops to Formula 1 standards. Time seemed to evaporate, as we enjoyed a quality day on the bike. At one point, when Yuri was peeling off the front, I looked over and mentioned "it is good to be on your wheel again, Yuri," before pulling through. Friendship is powerful and not to be taken for granted. Yuri, Eric, me, and my pops (left to right). Post-Gran Fondo. Saturday afternoon involved recovery at the GU tent, many stories, and maybe a little celebration... While Gran Fondos are informal, GU placed five riders in the top 10. Post-Gran Fondo. Mother and son. Much love! An outstanding group of GU employees led to a quality Sea Otter weekend. 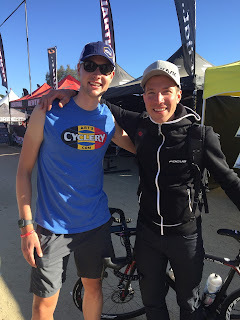 As the evening concluded, Jeremy Powers (J-Pow) happened to be strolling around. Owwwww! A fitting end to a wonderful day. Up and at it. Sunday morning included closing shop on the weekend camping plot, before venturing down for a quick 1:30 hours at the GU booth. During this time, GU tattoos were applied to calf left and calf right for my afternoon collegiate road race. Awww yeah! The Collegiate A Road Race at Sea Otter, which was hosted by Cal Poly Cycling, was sweltering and speedy. Over three hours, I went through eight bottles and was reminded that A's fields do not mess around. However, my afternoon was brightened when Colin Patterson, a Cal Poly teammate, bridged up to me and took victory in the Collegiate B Road Race. Solid work, Colin! In the afternoon, I managed some final hangout time at the GU booth. After early mornings and plenty of riding, I could not help myself. 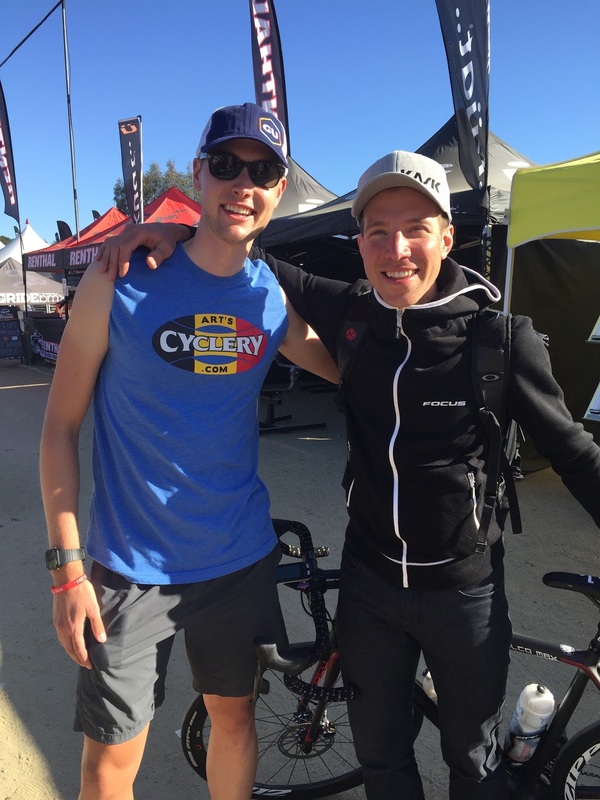 Celia, Brian, and Bridgett provided another hospitable and upbeat environment during Sea Otter's closing stages. Reluctantly, I said my goodbyes and proceeded to finish packing the trusty Honda Pilot for another road trip home. Cal Poly teammate Ray and I shared Sea Otter tales on the drive home. With that, Sea Otter 2016 was a wrap. To GU, thank you very much for welcoming me with open arms. I am extremely thankful for the opportunities that you have provided me, in addition to the humbling support. 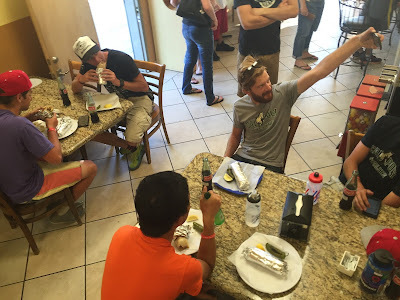 To my Cal Poly Cycling mates, thank you for the campfire conversation and road trip memories. I look forward to many more adventures in the near future.